Warm weather always signals the return of brighter colours, but never more so than spring 2012. With so many trends on repeat (feminine details, printed pieces, sporty influences), the key differentiator this spring seems to be a requisite pop of colour, preferably in one of these official colours of spring 2012. Coloured jeans or trousers in pastel or vibrant hues are a bold statement that's so of the moment. Pair with contrasting shades to play up the colour blocking trend that's back again this summer or tone the bright down a little by mixing with neutrals. Breezy blouses in an eye-catching shade work equally well with the aforementioned bright pant, but can also liven up neutrals. 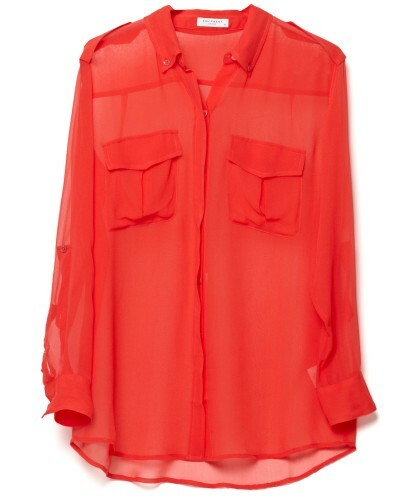 The colour to have is tangerine, deep coral, or hot pink. Tuck it in and sport a blazer in the office. Wear it loose on the weekends with ankle length pants and flats for a relaxed look. The statement bag is back with a vengeance and although it might feel risque, neon is the way to go. Use your bright bag as a pop of colour amongst a more neutral outfit or throw it in the mix amongst a colour blocked look. Many a celeb has been photographed wearing this sturdy leather satchel. As hard as it can be to step away from black, navy and beige, why not embrace one of the many colours of spring and start spreading the sunshine wherever you go! Image credits: Pantone, Zara, Dealuxe, and The Cambridge Satchel Company.